Terex Cranes UK held a customer open day at its premises in Long Crendon today where four 160 tonne Explorer 5600 All Terrain cranes were on display. The open day, which also took place yesterday, offered customers a chance to tour the company’s premises and view a range of Terex cranes on display. Of particular interest were the first four Explorer 5600 All Terrain cranes in the UK, which have been ordered by Southern Cranes & Access, ABA Crane Hire, King Lifting and Sangwin Crane Hire. Due for delivery in the next couple of weeks, Southern Cranes is scheduled to take the first unit. The five-axle 5600 features a seven section 68 metre main boom and a 21 metre bi-fold swingaway with a 12 metre straight insert, offering a maximum tip height of 94.6 metres. Features include a single engine concept, a newly designed cab, start/stop function, wireless remote control, and Terex’s IC-1 control system. Lifts requiring the full 46 tonnes of counterweight and rigging also only require a single additional transport vehicle. Other cranes on display included a 40 tonne AC40/2L city crane for King Lifting, two 60 tonne Challenger 3180s ordered by AB2000 and Sparrow Crane Hire and a 220 tonne Explorer 5800 for HTC Plant. 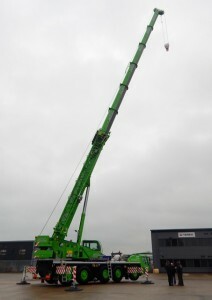 A 75 tonne Quadstar 1075 Rough Terrain crane was also on show, as well as a number of second-hand cranes.